Though Tender can be used as a "web only" service, email is usually the main contact point with your customers. 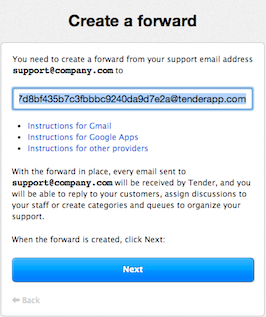 So the fastest way to get started with Tender, and start rocking your support, is to forward your current support email address to Tender. 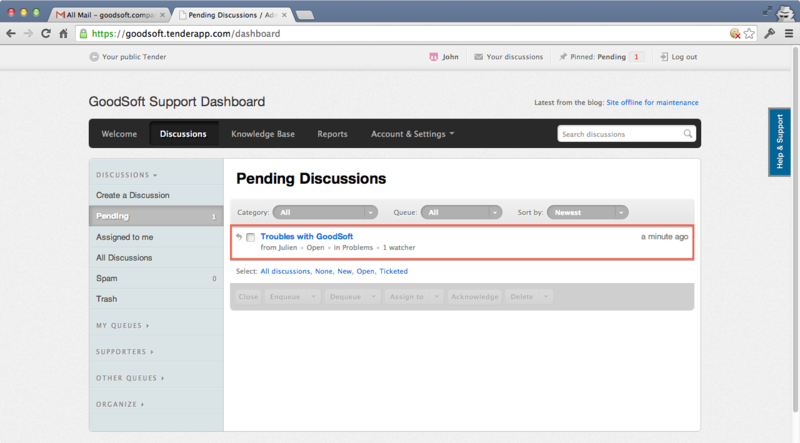 Tender will automatically create a new discussion out of each email that is received, attachments and all. It will also send a notification to all participants of the discussion. When users (or support) replies to those notifications, the replies will come back to Tender and appear as new comments on the discussion. Tender was designed from the ground up to be simple and this workflow replicates the normal workflow of email support, providing a smooth and easy transition. If you just created a support site, and you came here from the welcome wizard, you should already have the forwarding address and can move on to the next step. Depending on your needs, you may have one or more support emails. It is quite common to have a support@company.com for general support, and have a dedicated feedback@company.com for suggestions. Email addresses need to be unique for each category. For example, you could forward help@company.com and support@company.com to the Problems category secret email address, but then wouldn't be able to use help@company.com for the Suggestions category. 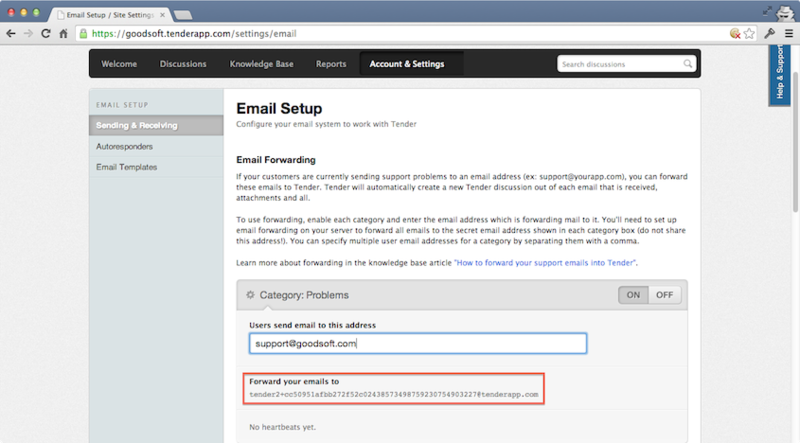 You can setup your categories and find forwarding addresses by going to Account & Settings > Email Setup. You can then "enable" email for specific categories by clicking the "ON" button, and filling in your support address. There you will see the special email for this category. Once you finished the setup process, the first thing you probably want to do is test it! So from a personal email address (different from the address you used to create your Tender), send an email to your support address support@company.com.